This stately Cornice container with its beautiful ornamental	23"W top will grace any location where refuse must be collected. 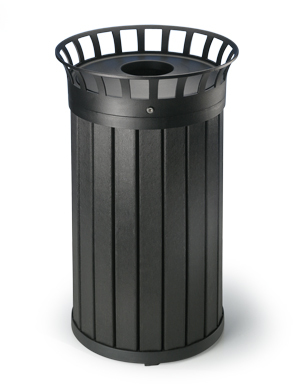 The receptacle slats are constructed of 100% recycled plastic that are attached to a powder-coated matte-black cast aluminum frame with stainless steel screws. Each unit comes with a 28 gallon rigid plastic liner.